Who to believe on tire inflation? I was reading an RV forum and found a number of folks offering their interpretation on what the proper inflation is for tires in RV application. Some insisted the only correct inflation pressure was what was shown on the "Tire Placard" or "Vehicle Certification label"
We have two separate issues to consider when selecting the minimum cold tire inflation pressure in RV application. A vehicle MFG has DOT requirements they need to follow. They are to specify the minimum inflation needed in the tires they provide on the new RV. That inflation is required to be sufficient to support the stated GAWR divided by the number of tires on that axle. Basically this means the axle rating is used to establish tire inflation based on the published load & inflation tables from the tire company. The owner of the RV needs to confirm the actual loading for their RV and should confirm they are not exceeding the GVWR or either GAWR or the individual tire load capability. You will immediately note that the RV company is making an assumption that is just not a reflection of reality, that being that axle loads are always split exactly 50/50 side to side. While many RVs may have the load split only a couple percent off of 50/50 some have discovered one end of an axle may carry more than 1,000# more than the other. Others have learned their unbalance is closer to 40/60 and some have discovered that their tires are overloaded as soon as they fill their fuel tank before loading anything else into the RV. Obviously a responsible owner needs to do a better job than some RV companies are doing. While some feel it is sufficient to just read the regulations about the vehicle certification label I and other tire engineers know that policy is not always the best way to get the best combination of ride, handling and tire durability. Lets see what Goodyear says in their RV tire application web page. "Correct tire inflation is a key component in tire care. The recommended maximum inflation pressures for your tires are indicated on the certification label or in your owner's manual. Since RVs can be loaded with many different configurations, the load on each tire will vary. For this reason, actual air pressure required should be determined based on the load on each individual tire. Inflation pressure should be adjusted to handle the tire carrying the heaviest load, and all tires on the axle should be adjusted to this standard." "The amount of inflation pressure required in each tire depends on the weight of the fully loaded vehicle, to include passengers, cargo load, fuel, and water." indication of how the weight of the recreational vehicle is distributed across the axle. " "Unlike commercial light truck and truck applications, we recommend weighing motorhomes at each wheel position of the vehicle (right front corner, left front corner, etc.). This is the only way to get a clear indication of exactly how the weight of the motorhome is distributed. Otherwise, one wheel position may be significantly overloaded even though the G.A.W.R. has not been exceeded. Tire inflation for a given axle should be set according to the pressure corresponding to the higher of the two end loads." Others are allowed to have and express their opinions and their interpretation of how the regulations are to be applied, but it was my job as a tire engineer to understand and work within FMVSS regulations for some 40 years. I will leave it up to you to decide if the only acceptable inflation is what is on the vehicle certification label or that inflation is learned by reviewing what major tire companies say in their published guides. 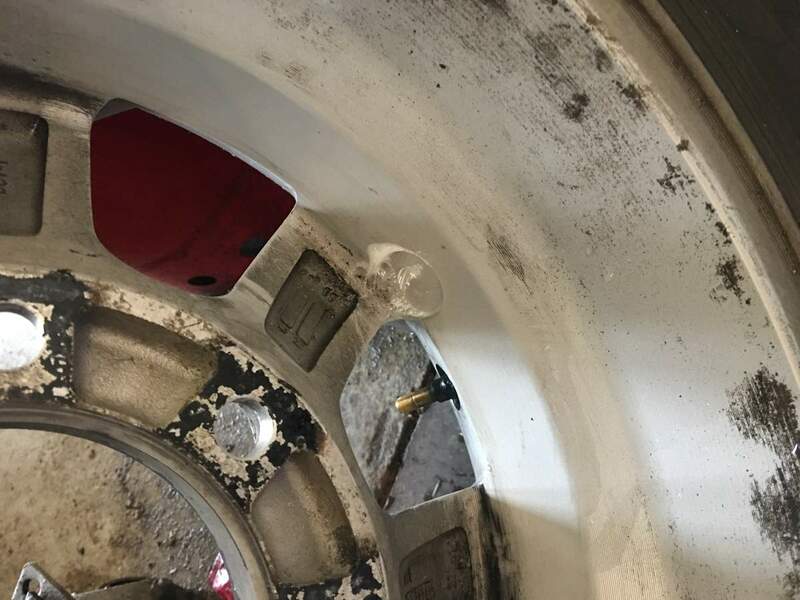 Wheel failures and "Silent Recall"
I have been seeing a number of posts on an RV Forum about cracked and leaking cast aluminum wheels on one brand of RV trailer. Some owners are reporting more than one failure. There appears to have been a manufacturing defect in the casting process which results in stress/fatigue cracks that eventually may lead to air leaking from the tires. Some folks are "lucky"(?) and are discovering the leak before there is a tire failure or the wheel fails and damages the RV. Others have reported damage. It appears that the wheel provider is aware of the problem, as many are reporting that replacement wheels are being provided and the cost of dismount and mount of tires is being paid for with no argument from the supplier. 1. They should be filing complaints with NHTSA as IMO multiple failures of this type should be investigated with the potential for a federally mandated recall and free replacement. 2. If the wheel supplier is quickly replacing these failed wheels, it appears they are fully aware of the problem and should have reported it to NHTSA per federal regulation. 3. I am concerned that tires on these wheels may be suffering internal structural damage from being run under-inflated. This damage may result in tire failure at some later date. It is entirely possible that owners may not connect the loss of air due to the wheel problem with the tire failures. 4. If the supplier is aware of the problem but has not initiated a recall or made public the facts but are simply replacing the wheels if or when someone reports the failure, this is what is known as a "silent recall," which is operating against federal regulations. Can I change from 275 to 295 size tires? "I need 6 new tires for '04 Dutch Star 38' on a Spartan chassis. Michelin tire models and sizing has me totally confused. Current Michelin size is 275/80R22.5. Dealers claim this Michelin size is interchangeable to 295/75R22.5 from brands that don't offer the original size. They tell me there will be no ill effects on the drive line or instrumentation." I was concerned with this possibly incorrect information. In this case the two sizes have the same load capacities so that was not my concern. Some folks replied to the original question by suggesting he use THIS or similar web sites to learn about tire sizes. I did have a little problem of using such a "tire size" site as the information is aimed at car application and does not include special information regarding dual tire application. Also the resulting numbers may or may not match published industry standards. I pointed out my concern about the Minimum Dual Spacing which is a published dimension in industry standards and has been covered previously in this blog. Some folks reported that they have changes tire sizes and had no problems and implying that any change might be OK. I provided this graphic to help people understand what this dimension is. 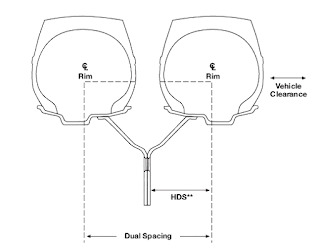 As you can see the wheel offset and even wheel thickness can have an affect on this spacing. I also pointed out this example. 275's have a MDS of 12.24 and 295's have a MDS of 13.19. Let's assume that with your wheels and with the 275's you have a physical 1.00" clearance down at the bulge in the sidewall near the road. So if you don't change wheels and put wider 295's on the new clearance will be 1.00 - ( 13.19 - 12.24) or 1.00-0.95 or a final clearance of 0.05"which is clearly too small. I hope that those considering changing tire size consider not only the load capacity, which is very important but also the dimensions. Sometimes people use their own terms when asking a question. Some RV forums have people answering questions using incorrect terms which can mislead others who may be reading the question or answer being offered. This is just a "Failure to communicate" which doesn't help anyone. Here are some common terms with their correct definition or example of proper use. Tire Load capacity This is the number of pounds a tire can support at a specified inflation. The Load/Inflation tables establish the various steps in load capacity associated with a level of inflation. Sometimes people incorrectly use the term "Tire Weight" which is incorrect. A tire itself may weigh 45# but it may be able to support 2,800# when properly inflated according to the Load & Infl tables. CIP or Cold Inflation Pressure is the measured Psi in a tire when the tire has not been warmed from running or from being in direct sunlight for the previous 2 hours. Technically we are talking about the Cold Inflation Pressure whenever we are discussing tire "inflation pressure". TRA or Tire & Rim Association is the US group that published the Load /Infl tables for tires made for use in the USA. There are similar organizations with similar tables in Europe (ETRTO) and Asia (JATMA). The numbers of pounds (Kg) and the associated PSI(Kpa) are many times the same or slightly different. The difference is due to using SI or Metric dimensions and rounding and conversions between units. It is legal to sell tires in the US that were designed to ETRTO or JATMA standards but the tires must still have the symbol "DOT" and the individual tire serial code molded into the tire sidewall and must still be certified by the tire manufacturer to be capable of meeting all the appropriate DOT regulations. DOT U.S. Dept of Transportation. The regulatory agency that specified the performance requirements for tires intended for use on public roads. "DOT Certified". This incorrect phrase is many times used by those that do not understand the regulatory process. The DOT does not certify any tire. It is the tire manufacturer that is responsible for "Certifying" that all tires they sell are capable of meeting the DOT Federal Regulations. FMVSS Federal Motor Vehicle Safety Standards You can read Sub part B of these standards HERE. Tandem axle. This is found on many trailers where each axle has one tire on each end of each axle. Here is a write-up on Tandem vs single axle trailers if you are not sure of the description. Tire loads are ALWAYS based on the load on tires on a specific position ie RF, LR, RR or LR etc. Front tires are "Single". Rear tires on most Motorhomes mounted side by side are "Duals". 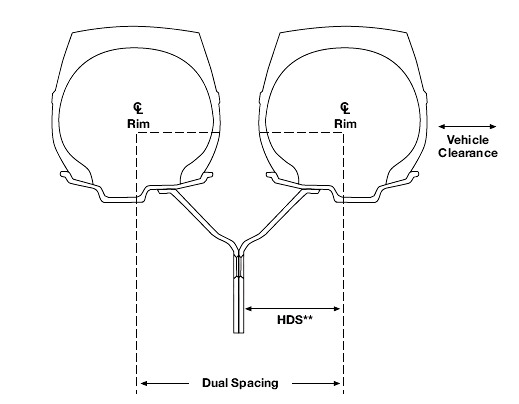 The tables show load capacity for individual tires in "single" position or in "Dual" position. You need to pay attention as some companies publish their own tables and show Axle loads or axle end loads which can lead to confusion. Tires on one end of an axle do not "know" what the load is on the other end of the same axle is. RV companies however assume axle loads are perfectly balanced end to end at 50%/50%. This allows the RV company to select the smallest (lowest cost?) tires capable of supporting 50% of the published GAWR but if one end of an axle loads that tire to 55% or 60% of the GAWR we would be looking at a tire overload situation. In trailer application with two or more axles they may be some load transfer between the axles such that the ends on the right side may share some of the side to side unbalance but I know of no case where all the side to side unbalance is shared equally between all the tires on one side of a trailer.